a.) Analyse, using examples, how barriers to entry may determine the degree of competition in leisure markets. The most competitive market form an economist may consider is Perfect competition, however, this is clearly a theoretical model against which to judge the real world. In practise the most competitive systems would be Monopolistic competition and Contestable markets. The former being an industry made up of many firms with little or no barriers to entry and the latter can be a small number of suppliers but critically again with the absence of entry and exit barriers. How much does it cost to build a cinema? in total, for as little as £1.5 million but a more typical cost for a good quality new build would be around twice that amount. Who Gets What From Your $10 Ticket? Ok, so you walk up to the box office and drop down your $10 to buy your ticket. Who gets that money? A lot of people assume (as did I at one point) that the movie theater keeps 50% of it, and the rest goes off to the studios. That’s not really true.Most of the money that a theatre takes in from ticket sales goes back to the movie studio. The studio leases a movie to your local theater for a set period of time. In the first couple of weeks the film shows in the theatre, the theatre itself only gets to keep about 20% – 25% of the green. That means, if you showed up to watch Bridget Jones’ Diary on opening night, then of the $12 you put out for a ticket, the movie theatre only got to keep between $2.40 and $3.00 of it. you imagine that? They had to over staff and have above normal capacity flood into their theatres… and they got to keep $0.00 from the ticket sales. That almost seems criminal. that a movie stays in theaters is shrinking. Bad news for the movie theaters. costing you $5, and a $0.08 cup of Coke is running you another $4… it’s because the economics of the industry system is so screwed up that the concession stand is where theaters have to make most of their money. The exhibition sector is dominated by a small number of companies that accounted for over four fifths of UK box office gross in 2008. 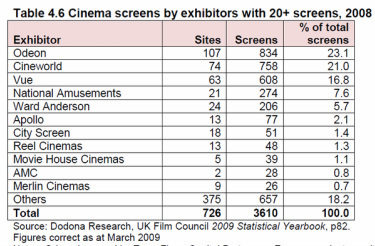 Private equity firms own the two largest exhibition chains: Terra Firma (Odeon) and The Blackstone Group (Cineworld), which between them operated 1,592 screens in 2008, 44% of the UK total (Table 4.6). The recent development of digital screens and digital 3D technology has enhanced the range of content possible on screen, including live events via streaming. According to Galloway popcorn has 1000% price mark-up, with Coke and Ben and Jerry's each being inflated in the region of 700-800%. So why are cinema goes happy to pay these absurdly inflated prices? Well Geoff Riley suggests two reasons why, the first is if cinema goers think they have got a good deal on their ticket price then they are perhaps more willing to pay a premium for their popcorn. Ticket prices have historically tracked inflation reasonably closely, but since 2010 there has been a noticeable increase in the average price due to, it is claimed, 3D tickets that are charged at a premium price. The consequence in UK has been that admissions to UK cinemas decreased by 2.5 per cent in 2010, breaking a run of three years of consecutive growth. 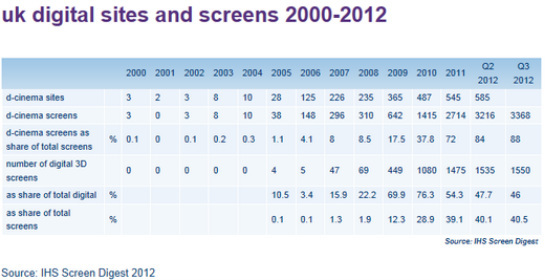 You could argue a number of reasons for this decline - online streaming, home cinemas, recession? However, perhaps it suggests that cinema goes no longer feel as though they are in fact getting a good price for the ticket, yet continue to purchase inflated food prices before taking their seats. Geoff's second argument centers on the idea that it is sales per customer which is significant, and it is the 'hard-core' cinema goers who consume a lot of popcorn when they go and watch movies both at peak and off-peak times, whilst the casual cinema goer has a lower per capita demand. This may well be true, but the casual cinema goer is likely to want the full cinema experience and for most this will include popcorn, sweets and a drink. So, is it simply this, the desire for the complete 'experience'? Well George Galloway iludes to 'pester power' - parents being unable to take their children to the cinema and passing the confectionary section without being relieved of significant amount of money. Is the answer simply that cinemas are a local monopoly, as George Galloway says, cinemas operate like private clubs. They are able to refuse entry, eject customers, as well as choose what they sell and, more importantly, at what price. This would suggest that confectionary within cinemas is highly price inelastic, but is simply raising the price going to lead to increased total revenue? Perhaps, but it has been known for customers to bring their own suppliers into the cinema, even if this is prohibited by the cinema. Journalist Charles Gant said that it is important to remember that the portion of the ticket price kept by the cinema isn't really enough to pay for the costs of the business, they need to make their money from concessions, which is why they're so expensive. So customers should not think in terms of the price of food and drink being a form of profiteering, but rather the high cost is enabling the individual to be able to walk through the cinema's doors at all. This maybe true, but is it acceptable? Does the industry need to address the imbalance in revenue flows in order to ensure cinemas are not relying on concessions to cover their operating costs. Do cinemas need to face the fact that people are consuming movies in different ways now? Does their need to be more competition between cinemas? Does their need to be more competition within the cinemas between confectionary sellers? Do cinema goes need to consider the ethics of sneaking their own food and drink into the movies?